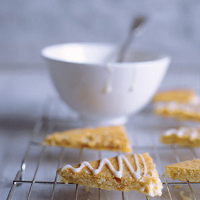 Plenty of freshly grated ginger and juicy dried apricots give these shortbreads an added burst of flavour. Like most bakes, these are best eaten as fresh as possible. Preheat the oven to 180°C, gas mark 4 and lightly grease a large baking sheet. Whiz the butter and sugar in a food processor until mixed. Finely grate the ginger and squeeze the juice from it, setting it aside. Add the pulp to the processor with the flour and ground rice. Blend until roughly mixed, add the apricots and quickly blend again until combined. Turn the dough out onto a floured surface and knead lightly until smooth. Put on the baking sheet and roll out a 27cm x 23cm rectangle with a smooth, level surface. Bake for about 20–25 minutes until pale golden. Leave to cool on the baking sheet. Using a sharp knife, trim off the uneven edges. Cut lengthways into three strips of even width, then cut small triangles from each strip to make simple tree shapes. Make the ginger juice up to 3 tsp with water (if necessary), and beat in a bowl with the icing sugar until thick and smooth. Drizzle the icing across the biscuits to resemble tree decorations. Leave to set.